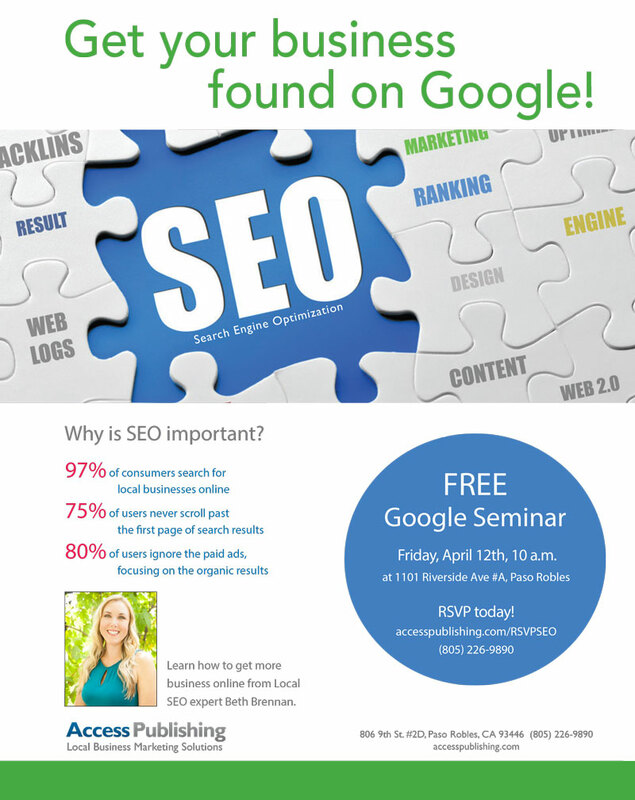 Local SEO expert Beth Brennan is giving a presentation on how to get your business or organization to rank better in Google search. Business owners and managers are invited to the free Google Seminar by Access Publishing. What is search engine optimization? “It’s an internet marketing strategy that helps websites and business listings rank higher in search engine results like Google,” says Brennan. “If you’ve ever wondered ‘how do I get my business found on Google?’ or ‘How can I rank higher on Google?’ this educational seminar will be an eye-opener,” she says. The hour-long seminar is Friday, April 12 at 10 a.m. at the North San Luis Obispo County Association of Realtors, 1101 Riverside Ave #A, Paso Robles. Reservations are required and seating is limited. Complete the form above to register.